Orlando has a big mix of theme parks, from the four Disney parks to Universal Studios Florida and Islands of Adventure to SeaWorld Orlando, as well as several water parks, but you might not realize that it has an amazing variety of hotels, too. 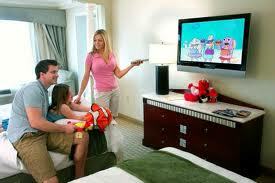 With so much competition, there are many great deals available on Orlando vacation hotels. Sure, you can stay on Disney property, but your best savings comes from choosing one of the many properties in the surrounding area. They’re convenient to all of the attractions, as well as restaurants and shopping. They have multiple swimming pools and family friendly amenities like water parks and miniature golf. Better yet, they offer large rooms and suites at extremely reasonable rates for budget-conscious travelers who want a lot for the least amount of money. The Holiday Inn Maingate East belongs to one of the most trusted hotel chains. You know you’ll have clean, comfortable accommodations, and if you stay at this hotel, you get the added bonus of close proximity to Disney’s Hollywood Studios, Epcot, and the Magic Kingdom. I-4 is just down the road to put you on the path to Universal Orlando Resort and SeaWorld Orlando. However, if your family loves to explore lesser-known attractions, you’ll enjoy the location on the 192 tourist strip that puts you within easy walking distance of rides, restaurants, and stores. Schedule a day just for exploration. The Holiday Inn Resort Lake Buena Vista is another Holiday Inn property located near Downtown Disney and the 535 tourist strip. You get the brand-name assurance of quality and a location that’s quite literally in the thick of all the excitement, with Disney almost outside your door and Universal and SeaWorld just a short drive away. The Baymont Inn and Suites Celebration is right near the west entrance to Walt Disney World, which puts you by Disney’s Animal Kingdom and the Blizzard Beach water park, with easy access to the other parks, too. It’s the perfect combination of staying in the midst of the Highway 192 attractions, yet being literally next door to Disney property. The Royal Parc Suites is for those who like immersive vacations that include a themed resort. If you don’t want to pay the high prices at Disney’s Port Orleans, this hotel gives you the same type of atmosphere at a fraction of the cost. You won’t get free breakfast at a Disney-owned hotel, but you get it here. It’s in a prime 192 location near Old Town, Fun Spot, and I-4, making it perfect for those who intend to see Universal and SeaWorld along with Disney World or who want to explore other attractions in their down-time. The Hawthorn Suites by Wyndham features a trusted brand name and a perfect location that’s central not only to Walt Disney World, but also to SeaWorld Orlando and Universal Orlando Resort. With free breakfast, a swimming pool, hot tub, and game room, there’s plenty to do at the hotel in between visits to the attraction. The food and shopping options are plentiful around the hotel, too. Liki Tiki Village is a tropical paradise for families, and what would the tropics be without a water park? That’s just one of the many resort amenities you’ll find here. Even though you’re just minutes from Walt Disney World, the resort is worthy of a whole day just enjoying the water activities, miniature golf, or paddle boats. The resort’s location adds to the sense of relaxation, since it’s on the west end of the Disney area, which is much more laid back. Mystic Dunes is a golf resort with an upscale feel and amenities that will make the kids reluctant to head over to the theme parks. After all, if they stay here, they can play miniature golf, have fun in the game room, and cool off in the water park. If Mom and Dad like golf, that makes it even more appealing. When you’re got this many amenities right on site, it’s easy to forget just how close you are to Walt Disney World. With all the great deals available on Orlando vacation hotels like these, you’ll probably need some help making a selection. The friendly advisors at 800-651-1005 can help you, or visit www.orlandovacationhotels.com to puruse the options at your leisure. The word “cheap” might sound a bit scary, but cheap Orlando hotels are actually excellent places to stay when you visit Walt Disney World. The hotels inside Walt Disney World have a lot of amenities, but you pay a lot of money for the privilege of staying at them. They’re contractually bound to sell Disney theme park tickets at the gate price, so you won’t find any deals there, either. The outside hotels are nice, clean properties that don’t have such restrictions, and they’re willing to go out of their way to earn your business. If you’re one of the one million visitors who flock to Walt Disney World each week, you can enjoy the parks while enjoying significant savings simply by staying at one of these cheap Orlando hotels. You can choose one just outside of Disney property or stay a bit farther away for a quieter vacation. Either way, you’ll love the cost savings. Just what can you expect at these cheap Orlando hotels? While the price is low, the facilities are clean and the amenities are plentiful. Value for your dollar is one of the biggest reasons for staying off-site. These hotels all have free scheduled shuttle service to the theme parks so you don’t even have to worry about driving. You can also stick around your hotel for a day of relaxation and enjoy typical perks like game rooms, pools, hot tubs, water parks, and playgrounds. Convenience is another big reason for staying off-site. It’s nice to be on Disney property, but you’re also very isolated. When you stay at a nearby hotel, you have easy access to the theme parks, but you’re also right by shopping, dining, and a whole host of smaller attractions that your kids will love. Let them hop behind the wheel of a go kart or gather everyone up for a dinner show or just take a walk around the area and see what fun you run into. When you want to head to Disney, it’s literally only a few minutes away. Many of these hotels offer free breakfast, like the Royal Parc Suites and the Hawthorn Suites, so you can fuel up your family at no extra cost. Some offer suites with kitchen facilities that allow you to make your own meals. There are plenty of places to buy groceries nearby, so now you have another way to save that adds to the big savings you already get from staying at one of the cheap Orlando hotels. Your hotel might even offer wholesale prices on theme park tickets, since it has the freedom to do so because of its off-site location, making it even more of a bargain. Because Orlando draws so many visitors, and has so many hotels, competition for business is fierce. Use this aggressive marketing to your advantage and seek out the hotels that offer the best prices and give you the most bang for your buck with luxurious amenities. 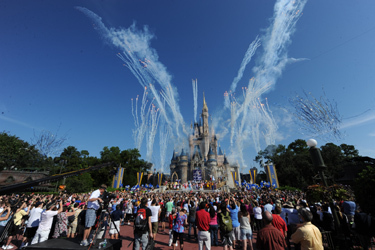 If you’d like help finding the best fit for your family, call 800-651-1005 or go to www.orlandovacationhotels.com. You’ll probably be surprised at just how many cheap Orlando hotels are out for your business and willing to give you a great bargain to earn it. Most people associate Walt Disney World with Orlando, but most of the resort actually boarders the city of Kissimmee, an area rich in Old Florida history. Kissimmee was once a prominent cattle ranching spot, and it still hosts the Silver Spurs Rodeo today. You can see some lovely unspoiled areas, including bald eagles and gators floating in their natural habitat, by taking air boat rides at places like Boggy Creek Air Boats or going on a hot air balloon ride. Some of the first off-site Walt Disney World hotels popped up in Kissimmee along the east stretch of Highway 192. As Disney continued to add theme parks, that development continued as well, and the city became more dependent on tourism for its economic base. With the addition of Disney’s Animal Kingdom and the opening of the 429 toll road, the development is stretching west, all the way to Highway 27. Today, you can get some amazing hotel bargains in Kissimmee. Many of the older properties have undergone significant renovations to add amenities and make them more attractive, even though they charge very reasonable rates. More smart travelers are starting to stay in Kissimmee to take advantage of the savings. While Walt Disney World has some lovely hotels on property, you’ll save a lot of money and stay in an ideal location when you opt for the hotels in Kissimmee. There are many to choose from, with a variety of accommodations, including suites. Many hotels in Kissimmee are situated in resorts with amenities like golf (both miniature and regular), lakes, and water parks. Because Kissimmee borders so much of Walt Disney World, you have a wide variety of areas from which to choose. Highway 192 is still the most popular spot for hotels in Kissimmee, and it has plenty of smaller attractions, restaurants, and stores to make it a destination on its own. It’s lined with miniature golf courses, go kart tracks, dinner shows, and other fun activities. The Holiday Inn Maingate East, the Radisson Resort Parkway, and the New Orleans-themed Royal Parc Suites are popular Kissimmee hotels because of their proximity to attractions like Fun Spot and Old Town, as well as the I-4 expressway. You can also easily explore Disney’s town of Celebration, which is a nearby spot for shopping, dining, and relaxing on the lakefront. The Baymont Inn and Suites and the Clarion Suites Maingate are just a little farther west, positioning them right near the back entrance to Disney’s Animal Kingdom and Blizzard Beach. Join the locals as they slip onto Disney property without fighting traffic. The Polynesian Isles Resort is in a lovely spot just off Highway 192, and it immerses you into the tropical feel of the islands. You can easily take Osceola Parkway onto Disney property from this hotel, bypassing the 192 traffic, yet you’re still close enough to enjoy all the tourist hot spots on the strip. Mystic Dunes Resort lets you add a few rounds of golf to your trip, and it’s in the desirable West 192 vicinity. It also has family friendly amenities like a water park, as does Liki Tiki Village, another lush resort geared toward fun for both kids and adults that sits near the quiet Highway 27 area. With so many of these hotels offering suites with kitchen facilities, and so many stores in Kissimmee, you’ll save money eating some meals right in your room. That simply adds to the savings you’re already getting on the room rates. 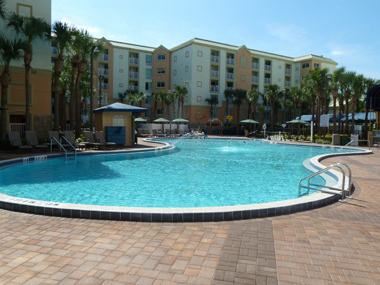 Call 800-651-1005 or visit www.orlandovacationhotels.com to find out which of these hotels in Kissimmee is the perfect vacation spot for you. When you think of visiting Walt Disney World, you might not think that the words “discount” and “Orlando hotels” go together. Yes, Orlando can be an expensive destination, but there are actually many great discounted Orlando hotels if you know how to find them. The main trick is to look at the hotel locations. You save money by staying outside of Walt Disney World property, and if you choose wisely, you’ll still be close to the Disney entrance and near all the other major theme parks. 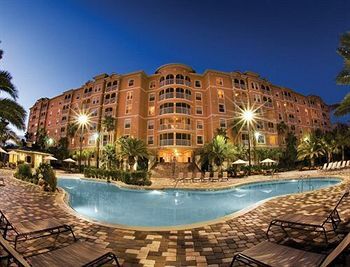 Consider staying at the discounted Orlando hotels that are within three miles of Disney property. They’re flagged on the www.orlandovacationhotels.com website, and they all offer substantial savings. Check the website or call 800-651-1005 for more information. You don’t compromise on amenities when you stay at one of these discounted Orlando hotels. The savings comes strictly from the fact that they’re just outside of Walt Disney World. Their location is actually an advantage if you like being able to shop, since there are plenty of big retailers like Target and Wal-Mart nearby, and you save money on dining, since you’ll find just about every fast food and casual restaurant you can imagine. You’re also in close proximity to smaller attractions where you can surf indoors, see how chocolate is made, or even get an aerial view from a helicopter if you want to try something different during your trip. Don’t worry about staying at one of these discounted Orlando hotels if you don’t have a car. Depending on which one you choose, many of the surrounding businesses are within walking distance, and they all have scheduled shuttle service to the theme parks. Instead of trying to find your way around, load up the family onto the bus and relax as you head out to your day of fun. With the money you save on the hotel, you can afford a few extra souvenirs. Some of the more popular and cost-effective discounted Orlando hotels include the Holiday Inn Maingate East, Holiday Inn Lake Buena Vista, Baymont Inn and Suites Celebration, Hawthorn by Wyndham, Royal Parc Suites by Quality, Mystic Dunes, and Liki Tiki Village by Diamond Resorts International. They’re all close to Walt Disney World, and their prices are all discounted when you compare them to the on-site properties. That doesn’t mean you compromise anything in quality. Instead, you pay less and get a lot more for your money because of their amenities. In addition to providing free scheduled shuttle service to the theme parks, these hotels all have their own special qualities. For example, Mystic Dunes has a golf course, and it also features a water park, as does Liki Tiki Village. Royal Parc Suites whizzes you into the world of New Orleans, and it’s right across the street from attractions like Old Town and Fun Spot and within a stone’s throw of the town of Celebration, as is the Holiday Inn Maingate East. Many of these properties are clustered just outside of Downtown Disney, including the Holiday Inn Lake Buena Vista and Hawthorn Suites. That means you’re not only close to lots of shopping and dining at Disney, but also the Crossroads restaurant area. The Baymont Inn and Suites Celebration is near the “secret” west Disney World entrance used mainly by locals and people who are fortunate enough to stay at the convenient hotels nearby. All of these discounted Orlando hotels are great options. 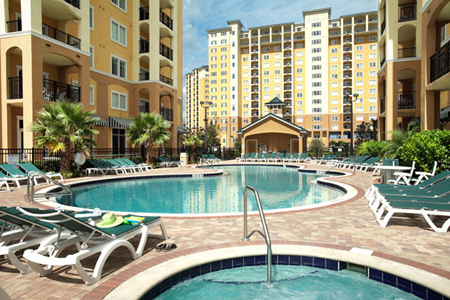 Call 800-651-1005 or visit www.orlandovacationhotels.com to narrow your choice for the best one for you. Hotels near Disney World offer some great deals, as long as you know where to find them. Not only do they charge reasonable rates, but you get an amazing array of amenities that equal or exceed what you’d find at many of the hotels on Disney property. What can you expect at these hotels near Disney World if you’d like to book one for your family? Depending on which property you pick, you can expect things like scheduled shuttle service, which means you won’t pay parking fees at the Disney parks, plus expansive pools/water parks and play areas, suites with kitchens, and even decor on a par with the Disney properties. For example, if you stay at the Royal Parc Suites, you’ll feel like you’re in the French Quarter in New Orleans. One of the big draws of the Disney hotels is their rich theming, but the Royal Parc Suites offers this amenity at a fraction of the cost. Perks like a free breakfast buffet, including gourmet coffee, and a gorgeously landscaped pool ensure that you get your money’s worth. Even though these hotels are outside of Disney property, they’re so close that it takes you literally just minutes to get to the theme parks. If you stay at the Royal Parc Suites or the Holiday Inn Maingate East, you’re not only close to Disney’s Hollywood Studios, Epcot, and the Magic Kingdom, but you’re near the town of Celebration, which makes a nice side visit. You’re also within walking distance of Old Town, Fun Spot, and many other attractions and restaurants on Highway 192 and right near the I-4 expressway. The Baymont Inn and Suites is also on 192, but a little west, putting you right by the back entrance of Disney property, where you can easily get to Disney’s Animal Kingdom without any traffic struggles. Mystic Dunes is in the same area, and it’s the perfect spot if you’ve got a golf lover in the family. Meanwhile, the kids can enjoy the four swimming pools, including the Dunes Lagoon water park. Go a little farther west and you’ll find Liki Tiki Village. This resort proves that hotels near Disney World can be destinations on their own. With its water park, miniature golf course, lakefront beach, and other amenities, it’s great for rest and relaxation and puts you close to Disney World, with easy access to Highway 27 if you’d like to venture to Legoland Florida. There are plenty of hotels near Disney World on the Downtown Disney side of the property, too. 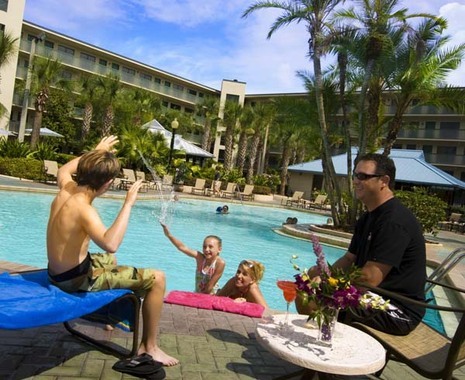 Some great choices include the Holiday Inn Lake Buena Vista and the Hawthorne Suites. Both of those amenity-packed hotels offer easy access to Downtown Disney, and you can take easily the back roads to SeaWorld and Universal Orlando Resort or hop on I-4 just down the road. If all these great choices have piqued your interest, find out just how affordable it is to stay at these great hotels near Disney World. 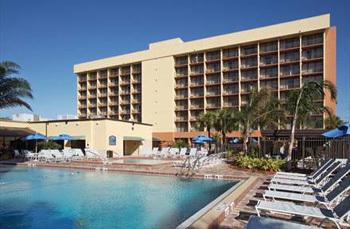 Call 800-651-1005 or visit www.orlandovacationhotels.com for more information and rates. Park hopping is a great way to see Walt Disney World because you can visit more than one park in a single day. Visit a park in the morning, then pop over to the Magic Kingdom to see fireworks or Epcot for Illuminations. Get an early start, then head back to your hotel for a while to let the kids relax before going out to another park later. Hopping is very affordable this summer because you can buy a three-day Disney Park Hopper pass and get three days of hopping absolutely free. It gives you the ultimate in flexibility. Perhaps you’d rather stick to seeing a single park each day. In that case, but a four day base Disney ticket and get an additional day for free. 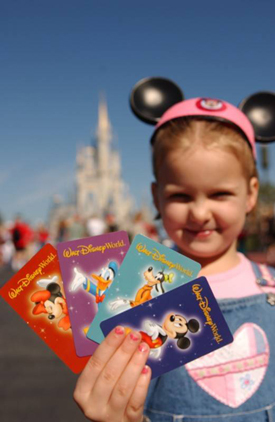 That lets you spend on day at each of the four Disney parks, then do a repeat. If the kids had a clear favorite, go back for another visit. Or maybe you didn’t get to see everything you want to at one of the parks. Spend your last day there, doing everything you missed. If you’re a Florida resident looking to do a staycation, there’s a limited time offer that lets you buy a three day Park Hopper or base ticket for less than 50 percent of what you’d pay at the gate. Even if you live in the area, it’s great fun to gather up the kids and stay at a hotel near Walt Disney World for a few nights of pure fun. Mickey is the Big Cheese in Orlando, but the other theme parks are worth exploring, and you can get a great deal on SeaWorld this summer. The park is well known for its orcas and dolphins, but many people don’t realize that it has a water park, Aquatica, right across the street. Aquatica has some animals, like fish, macaws, and Commerson’s dolphins, but water slides, rivers, and wave pools are its big draw. You can buy a SeaWorld and Aquatica one day combo ticket for $23 less than you’d pay the the gate. Better yet, you get two additional days for free. That means you can explore SeaWorld Orlando on the first day, then take a break at Aquatica before returning to see Shamu and his friends again. Or maybe your kids love the water and would rather hit SeaWorld for a single day and spend the rest of their time on the water slides and in the wave pool. 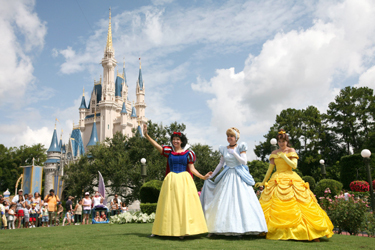 In order to get one of these special deals, you must purchase lodging through orlandovacationhotels.com. 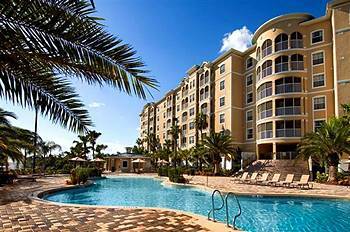 The website has a number of quality hotels and resorts in the Walt Disney World and SeaWorld areas at extremely reasonable rates that compound your savings. Book online or call 1-800-651-1005 for personalized help.